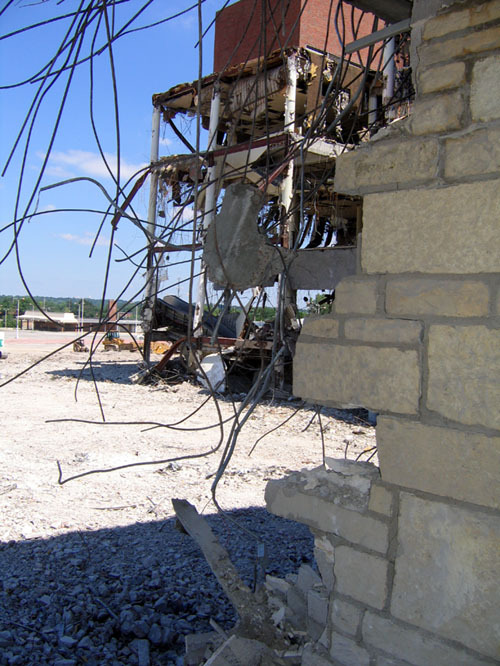 Here’s a good story to end May 2013 Preservation Month. 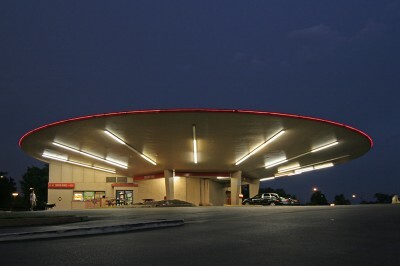 In 1967, architect Richard Henmi designed the striking building above. 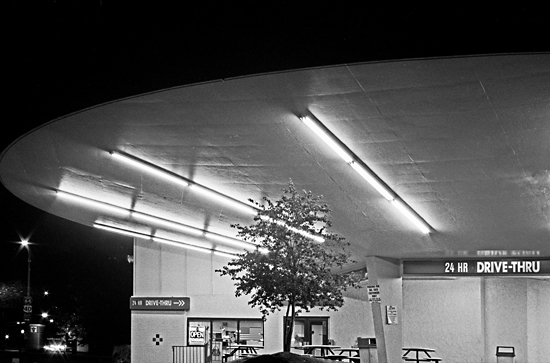 Over the decades, it went from a gas station to a pair of taco fast-food restaurants. Then the building went vacant while the Council Plaza it is part of was being revived with help, in part, from Missouri Historic Tax Credits. Then in 2011 news leaked out that the developer of Council Plaza was seeking permission to tear down “the saucer.” Here was the reaction to the details of politics as usual. 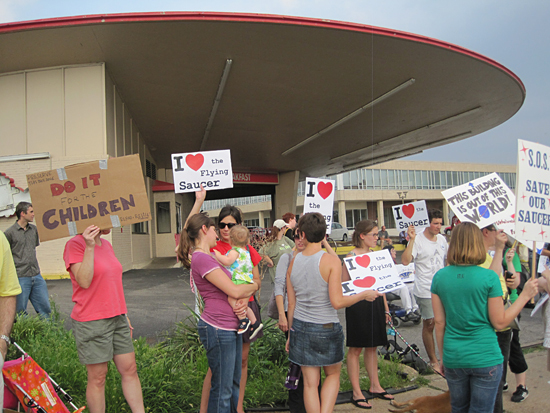 And this is what hundreds of St. Louisans did to protest the intent of the developer and some pockets of the Board of Aldermen. 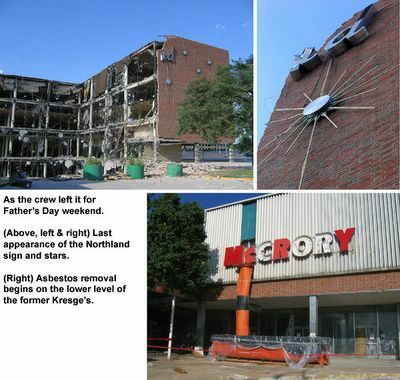 Turns out it wasn’t just meddlesome preservationists who loved this building – most everyone was fond of it and couldn’t understand why anyone would want to demolish it. 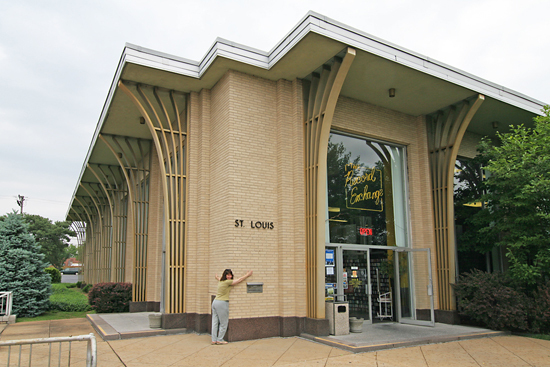 Both on the streets and via social media, we made a ruckus and offered up solutions for ways to re-use an iconic piece of St. Louis architecture that already qualified for historic tax credits. 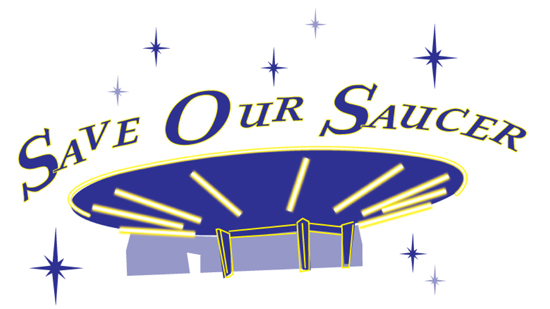 Here’s one example of the things we did to Save The Saucer. 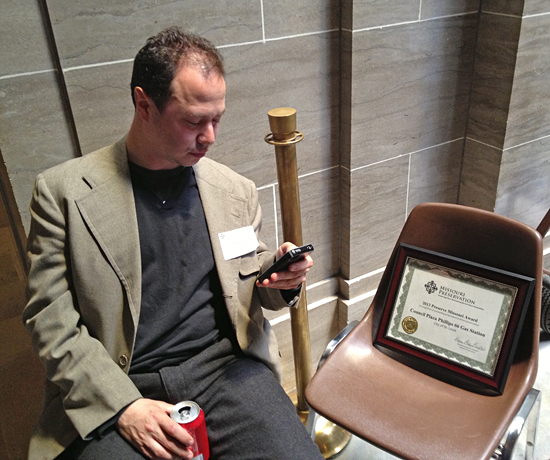 The award ceremony at the state capitol in Jefferson City, MO was cancelled due to snow in February, and rescheduled for May 7, 2013. That was a happy accident because it felt better to have this celebration during National Preservation Month. A small group of us representing the dozens of people whose passion played a big role in changing the right minds drove down to be a part of the ceremony in the rotunda. Here is the list of 2013 award winners we are so proud to be included among. All acceptance speeches that morning made note that Congress was, literally at that moment, voting on the fate of the Missouri Historic Tax Credits. One politician presented the award to his constituents and had to high-tail it off stage to go vote when the bell rang. The irony of it was not lost on anyone. Everyone had to wait 10 more days to learn that the tax credit remains unchanged. As is the case every year, the battle will surely resume again. 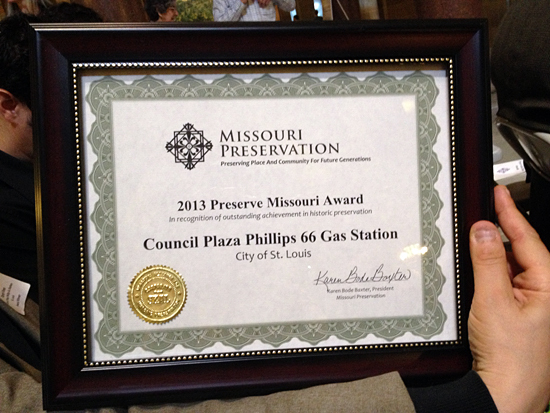 I wonder how each politician who on that day handed a preservation award to the building owners voted on the bill. Here we are in the afterglow of this triumphant chapter of the tale of the saucer. From left to right: Lindsey Derrington, Jeff Vines, Randy Vines, architect Richard Henmi and me. 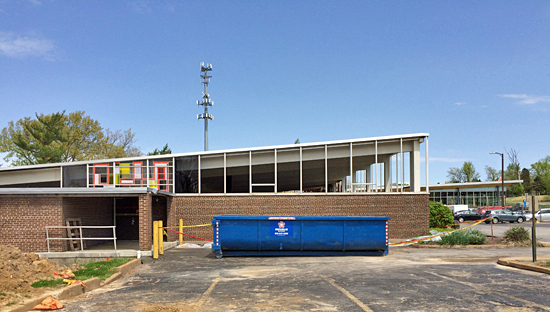 • This marks the first mid-century modern building to earn this recognition. 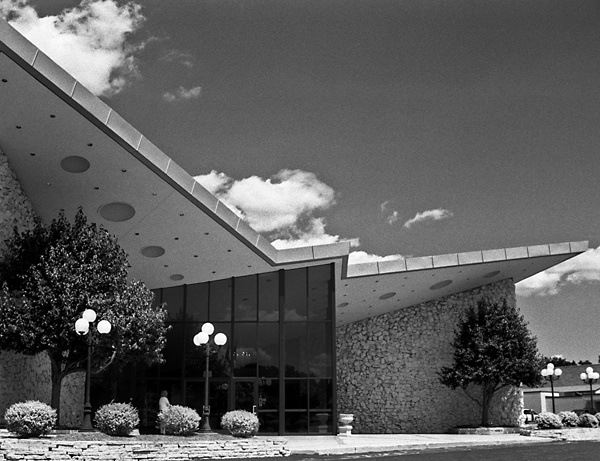 Along with Ladue Estates on the National Register of Historic Places, it’s with relief and gratitude that we now know Missouri recognizes and values MCM architecture. 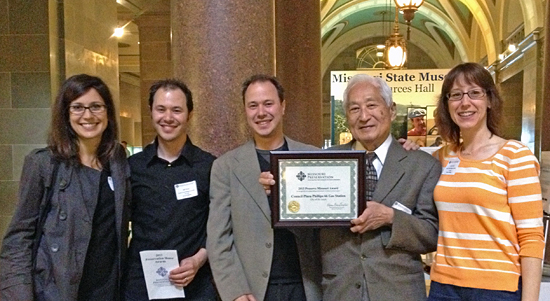 • We were the only project that day to have the building’s original architect on hand to accept the award. It’s wonderful that our Modernist architects receive this kind of recognition while they are still here to know how important their contributions are. • Ours was the only award that day that did not go to the owner of the building. • Our St. Louis City group was the only one to not have a representing politician speak on our behalf and present the award. Thank you to everyone at Missouri Preservation for making such a milestone bold choice, ushering in a whole new era of historic preservation. And then they even fed us! 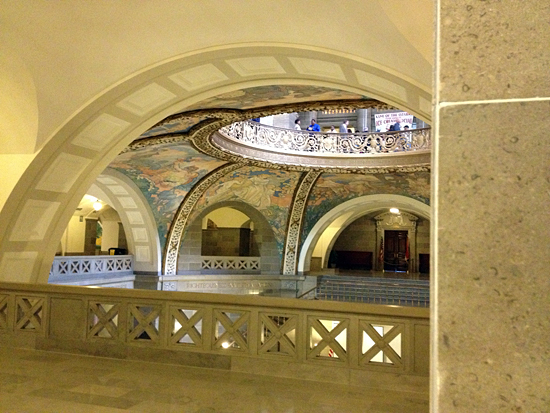 The luncheon gave us the opportunity to explore the state capitol, which is truly magnificent on so many levels. Whenever you may feel overwhelmed by the rancor and confusion of state politics, walk through these halls to instantly feel better about the past, present and future of our state. It perfectly embodies what great architecture does for the soul – it inspires. Our group wanted Richard Henmi to keep the preservation certificate, and he was respectfully insistent it remain among us all. To that end, the plaque now hangs permanently in the StL Style storefront on Cherokee so that everyone can always be reminded of what they accomplished by loving The Saucer enough to stick up for it. Thank you to Randy (above) and Jeff Vines for giving it the perfect, permanent home. 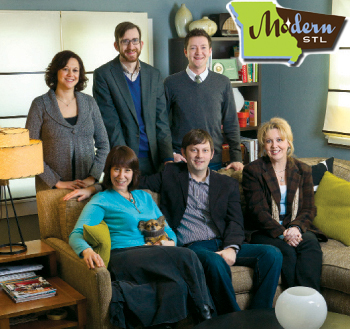 On February 11, 2013, the Cultural Resources Office of St. Louis presented to the public the results of their survey of non-residential mid-century modern architecture in the City of St. Louis, MO. 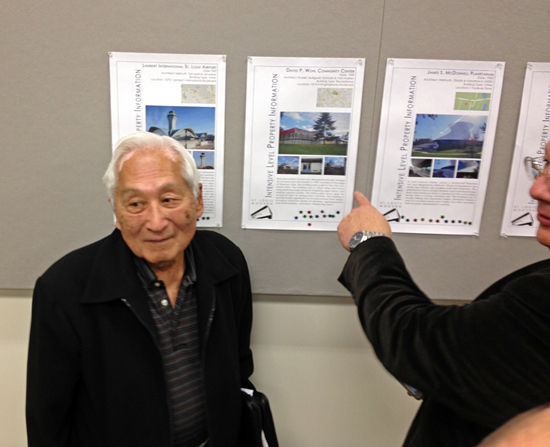 The details of their survey work during 2012 is documented here. Office at Monday’s meeting reiterated how genuinely difficult it was to come to that new number. They all fell in love with certain buildings, harbored their favorites. But because it’s a limited grant budget, and all this historical research takes time and money, the 40 buildings need to be narrowed down to 20-25 buildings that will make the final list. That’s why they are asking for St. Louisans to weigh in on which buildings we think should make the final cut. Here is the first part of the list of buildings. Here is the second part of the list of buildings. 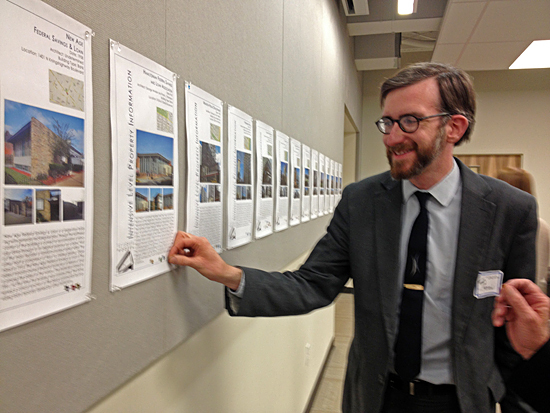 Those in attendance were given a sheet of 16 stars to place upon the buildings we liked most. Here’s Michael Allen bestowing one of his stars upon a building he wrote about. Turns out this South Grand vacant bank is already under threat of demolition for a new independent grocery store building on the lot. And this highlights why it’s important to have this list of our significant MCM architecture: if one of these buildings should come under fire, there will be documentation to prove why it matters. 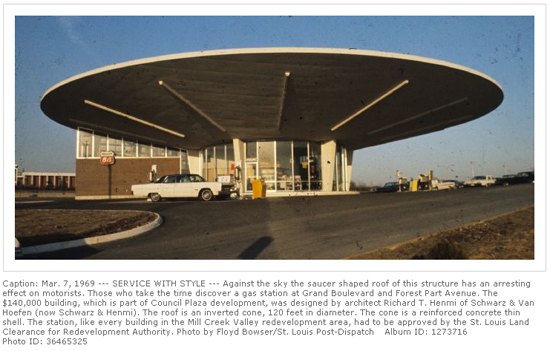 Henmi, the architect of the Flying Saucer in Midtown, will also be in Jefferson City on February 27, 2013 as one of the people accepting a 2013 preservation award from Missouri Preservation. This is shaping up to be a special year for him, and all of us who love his work and those of his professional peers. 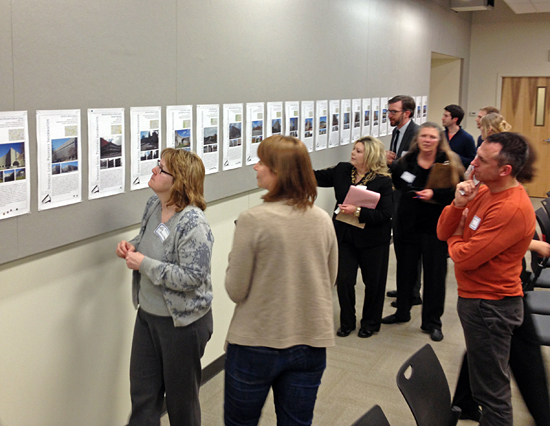 They need your feedback by February 15, 2013 on which 20-25 buildings deserve further research to make the final list. 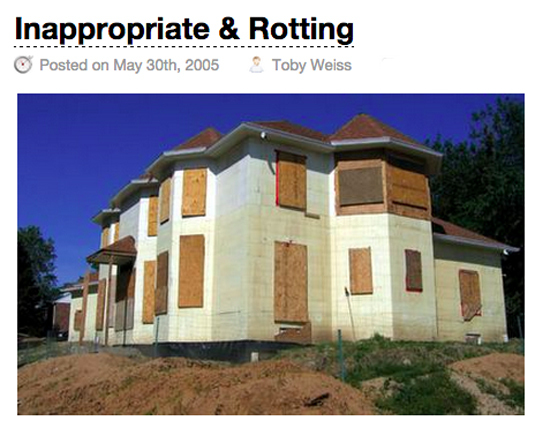 Please review the 40 buildings. Download the comment sheet here, which also has information on where to send it. 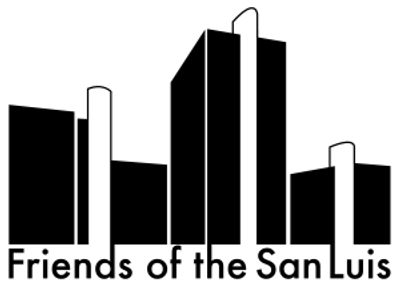 documentation and statements of significance that put them in historic context and serve as framework for the property owners and others to use for the architectural preservation and appreciation of these buildings. Stay atop any breaking news on The Finalists by following Chris Madrid French on Twitter and Missouri Preservation on Facebook. Or just check back with B.E.L.T., ‘cos you know how freaking excited I am about all this!